Our dinner at Fukusuke Horikawa was one of our first sushi meals in Tokyo and probably the only unplanned one as we had actually a last minute change of plans for the day and ended up in Ikebukuro. We were looking for a nicer place for a special dinner when we came across the lifts to the Sky restaurants located on the 58th and 59th floor and had a peek to see what was up there. We were pretty much sold once we stepped foot in the lift, a sky themed ride up from ground floor straight up to the restaurant levels, I was so mesmerised that by the time I took my camera out, the ride was already over! There’s a handful of restaurants on the 59th floor, each with views but we chose Fukusuke Horikawa as it was one of the few Japanese options available. We made a quick reservation and returned for an early dinner- an excellent decision as it not only meant that we got to choose a nice window seat (with incredible views!) but we also got to watch the sun set and the city turn into a beautiful fluorescent lit environment. We had expected to pay an arm and leg for the nice views, but we were surprised to find that the menu was very reasonably priced, with sushi sets starting from 1620 yen (~$20AUD) for dinner (less for lunch) and drinks on par with most other restaurants we’d been to in Tokyo. We thought we’d go a little fancy an opted for one of the fancier looking multi course sets (Yuraku set, 5400 yen ~$60AUD) and chirashi sushi to share. We start with a plate of assorted sashimi, plated beautifully and looks every bit as incredibly fresh as it tastes- I don’t think I’ve ever seen tuna in this shade of deep, scarlet red! I’m usually quite picky when it comes to sashimi but there honestly wasn’t a single component of this dish that I didn’t like- even the prawns which I tend to shy away from! The Fukiyose Chirashi (2700 yen) comes in a quite substantial 2 box serve, with an assortment of fresh sashimi beautifully arranged atop a thick bed of rice. We’re quite impressed that the dish looks exactly as it does on the menu. 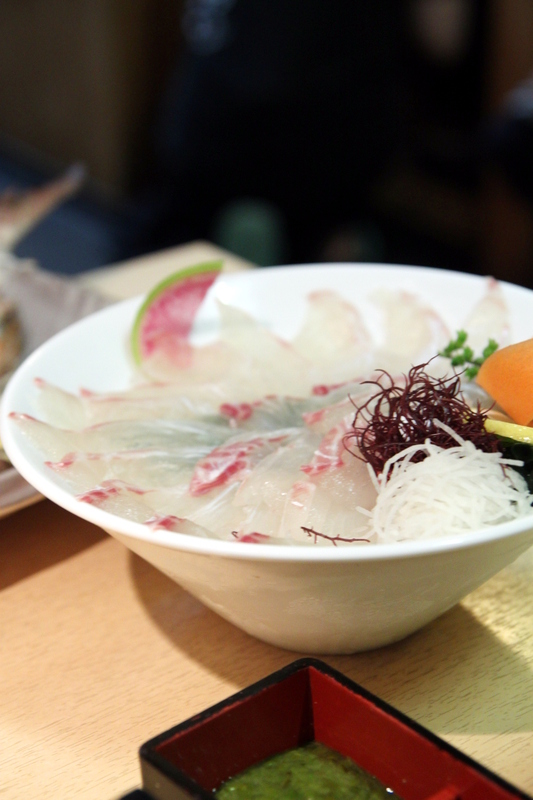 The sashimi is no less fresh and delicious as that of our plate of assorted sashimi. 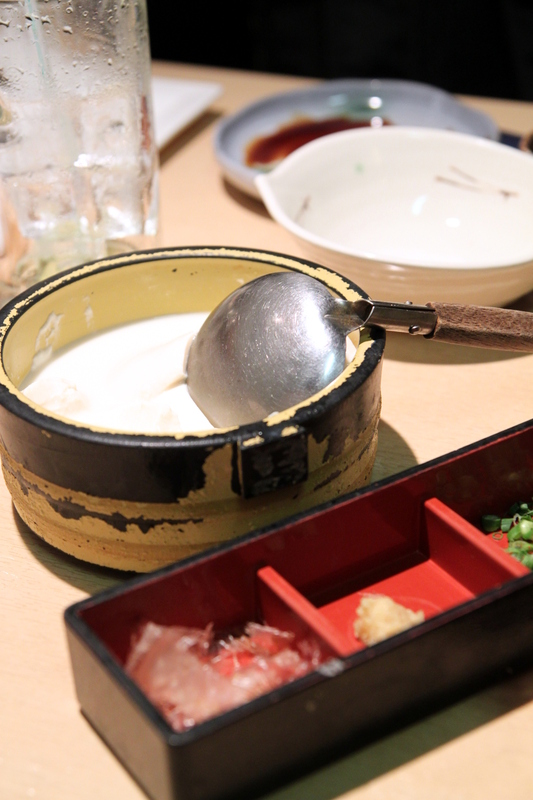 There’s probably some reasoning for the order in which the courses are served, but the serve of chawanmushi is certainly welcome in between the sashimi and the sushi, to give a short break from the raw fish. The steamed egg is soft and delicate, with a light yet rich unami flavour. I’ve yet to meat a chawanmushi I don’t like, but this was top stuff! And eventually we reach the sushi selection- what we’re really here for! We’re not too sure what half of the fish is on the plate, as most of it is not what we’ve come across before. Each piece is shaped perfectly, the rice portioned into bite sized balls topped with beautifully sliced pieces of fish, each cut into almost an identical size and shape to one another. We’re thinking the selection may be seasonal as the selection we received was slightly different to what was pictured, and it certainly did not disappoint! It’s not often you get dessert at the end of a sushi meal but the small, portion controlled square of tiramisu was the perfect end to the meal. 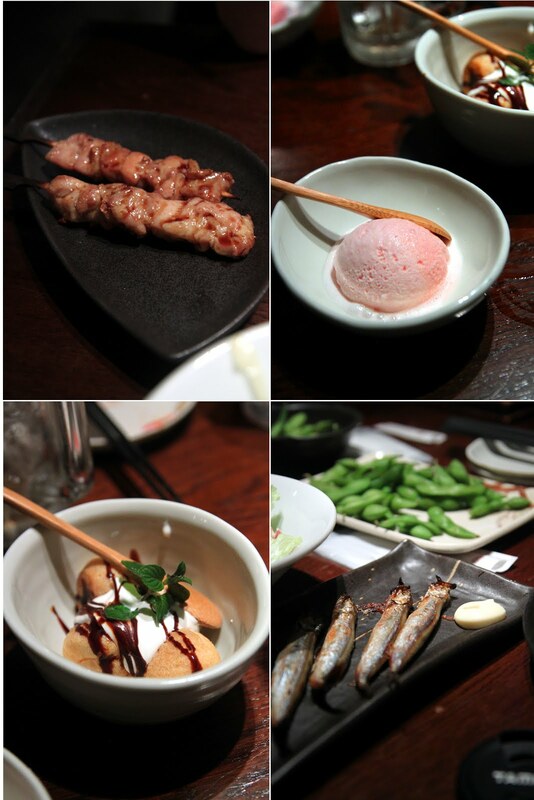 Somewhere on our list of things to try in Japan was Izakaya and where better to pop into an izakaya bar than Shinjuku? The only problem was that there were way too many to choose from, and after walking around all the small alley ways, we end up choosing an upstairs Izakaya bar, which we later realise is a chain that we spot in almost every suburb we visit in Tokyo. It’s a more spacious area than the bars we spot downstairs but the vibe’s not quite the same, although there’s plenty of conversation, laughing and smoking going on. 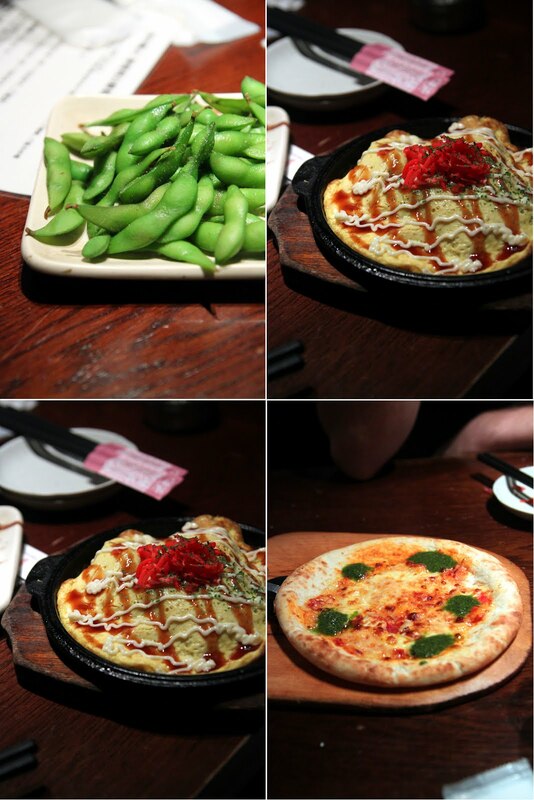 Perhaps we’re too used to Japanese restaurants which tend to specialise in a particular dish or type of food, but it’s quite strange for us when we see the variety of foods on offer at Kin no Kura- there’s everything from sashimi, sushi, salads, potato chips and even pizza! The prices are quite reasonable too, but we thought we’d go all out and choose the buffet option to give everything a try. There’s a drinks buffet option too (with plenty of beer, which seems to be more popular), however we still needed to get back to our accomodation that night so we thought we’d better not! There’s plenty of fried food options, perhaps as it goes better with beer- from fries and onion rings, to karaage chicken, and more exciting options like fried cheese mochi- literally a deep fried mochi ball with a chunk of cheese enveloped inside (which unfortunately was not as exciting as it sounds). I’d give the sushi and salads a miss though, which were not particularly fresh, the stale bread leaving a bad taste in my mouth. The cooked foods were much more enjoyable, and surprisingly, the best dish of the night was the margherita pizza (that kind of says something about the food). Nevertheless, it was a different dining experience in Japan! 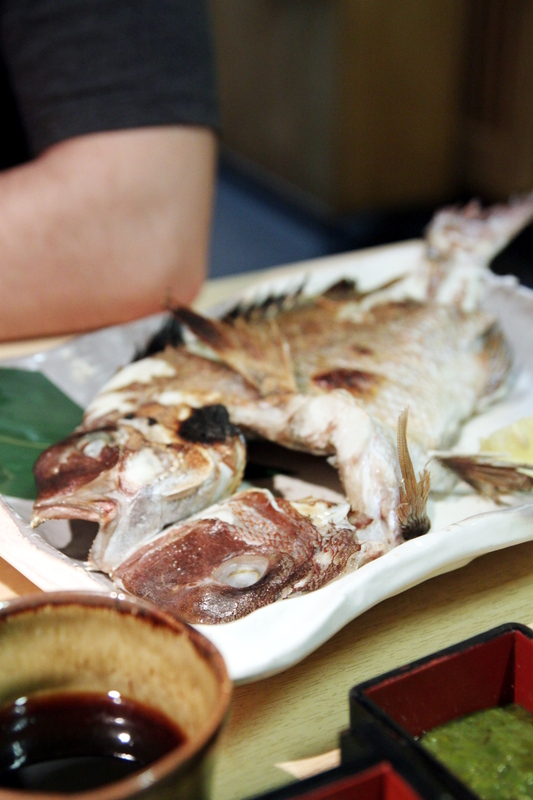 But when it comes to different experiences, the one thing that did leave a lasting memory was our meal in Zauo, the famous fishing restaurant which pops up on pretty much every recommendation list for ‘dining experiences’ in Japan. Essentially, Zauo is a massive fishing pond, the restaurant itself, designed like a large boat sitting in the water. If you’re lucky enough, you’ll get a table on the ‘boat’ and get to fish directly from your table. Otherwise, as was the case for us, you can get an ordinary table up the back and choose a spot to do your fishing. Fishing is completely optional, if you prefer you can order fish off the menu (so you won’t go hungry if you’re not any good at fishing!) but catching your own fish also means you get a slight discount on the price. To participate, grab a fishing pole by the side of the water and stick it in the water. Some of the fish can be caught solely with the hook but if you’re after the larger seabream, you’ll need bait as well, which can be purchased for 100 yen. There’s four varieties of fish (plus lobster) to choose from, each separated into their own pool so you can choose what you are after. As a complete fishing novice, it was a matter of luck for me. I stuck my hook into the mackerel pool and 30 seconds later I got my first catch! And as if that’s not exciting enough, each catch is celebrated with a bit of a chant and some banging on the drums. There are a selection of cooking methods, we simplest i.e. sashimi and did not regret it at all. After our quick catch, we had eyes on bigger fish, specifically the sea bream which made up the majority of the pool. Unfortunately, it was not as easy and we spent some half an hour or so walking around with bait on our line with no luck. Just when we thought we had had about enough, and were about to resort to ordering fish off the menu, we struck gold as a massive sea bream caught onto our line and we rushed to pick it up before it fell back into the water again. Woo-hoo! Because our sea bream was so large, we had the option of cutting the fish into halves and getting it done two ways. 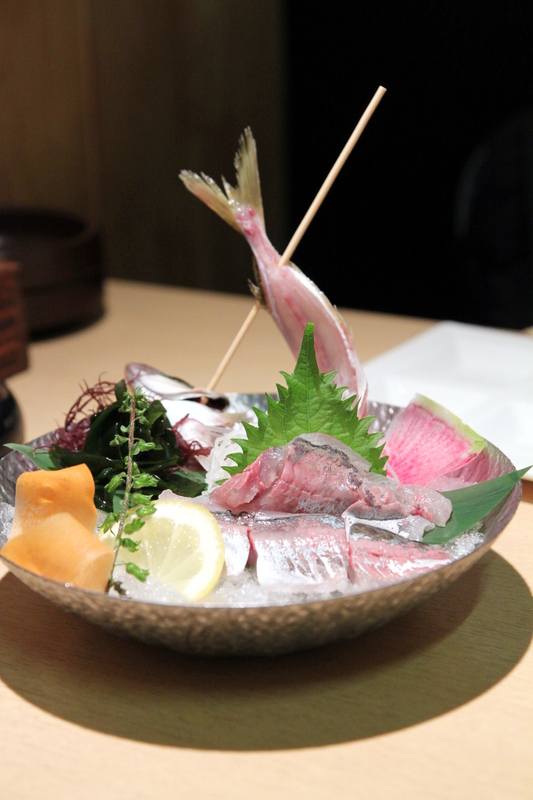 With the fish so fresh, we opted to try fish both as sashimi as well as grilled. Although fish is really the main attraction, Zauo also offers a full menu mostly seafood based items which aren’t available for fishing, for obvious reasons (fancy fishing a whole tuna?). We’d ordered prior to catching our sea bream when things were looking a little grim, not realising how large it was going to be …….and so we ended up with a bit too much food for two. With so much protein, we needed some carbs to go along with it, so we went for some noodles. 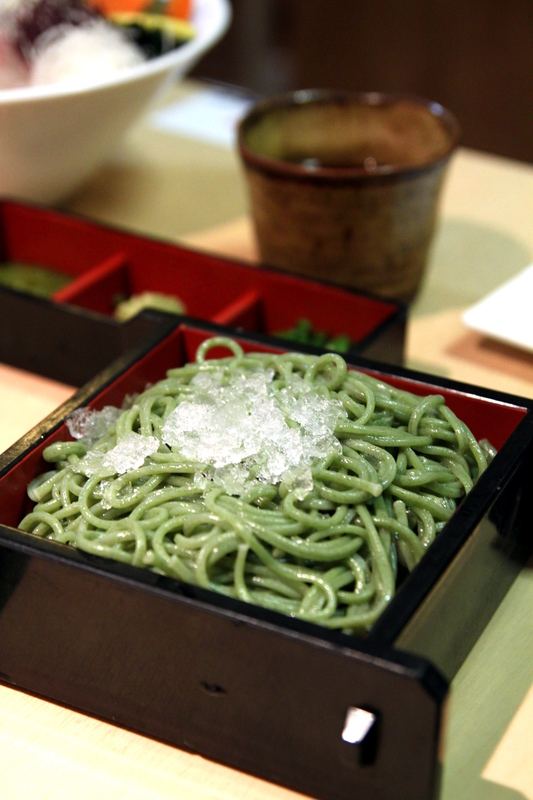 I had initially thought that these were green tea noodles, but the Isomen is actually seaweed noodles. The seaweed incorporated into the noodle dough itself to give the green hue, although surprisingly it doesn’t add much flavour. Served with ice and sides of dipping sauce, wasabi and shallots, it was not unlike having soba or somen, and definitely a great accompaniment to our fish heavy meal. The soft silky mess that was the tofu with soy milk had a rich soy flavour and almost seemed out of place in this meal. Served in a round tub, its presentation reminded me of the Chinese tofu pudding, so I did find it rather odd when served with soy sauce and shallots. We can’t leave Japan without experiencing the Japanese sushi train, so we find ourselves in Uobei for lunch. 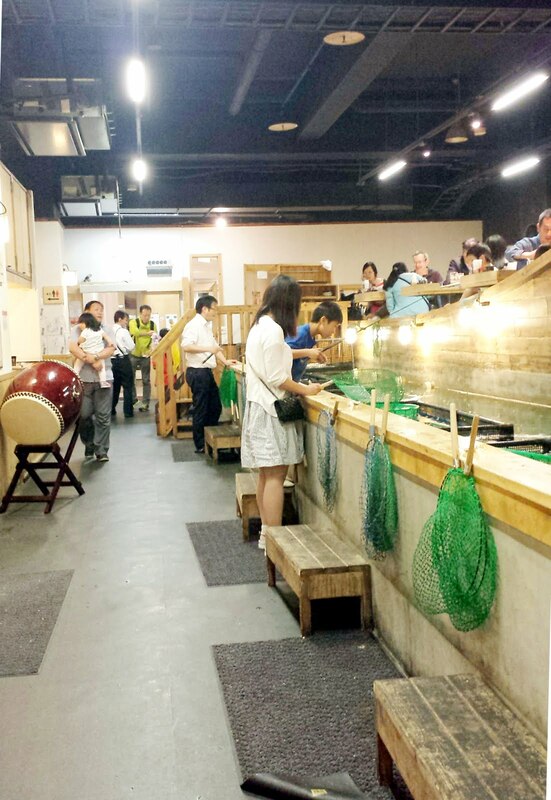 Unlike the most sushi train joints, which are more accurately sushi conveyor belts, Uobei offers something closer to an actual sushi train, as it does move from the kitchen, along the dedicated tracks to stop right in front of you. And the best bit? Each dish will only set you back 108 yen!! The menu is really extensive, with pages and pages of sushi, from the more familiar salmon/tuna, to some fish varieties I’d never heard of. There’s also additional options such as ramen and sushi platters, but we’re here for the 108 yen sushi. You can only order three items at a time, as this is the maximum capacity of the ‘train’ but once you place your order, you can immediately put through your next one. The sushi is super quick to come out, but there’s even games on the touch screen should you ever get bored. We start of with the more familiar sushi like the salmon and kingfish nigiri, salmon aburi nigiri and tempura prawn rolls, which were surprisingly fresh and delicious. We’re pressing buttons left, right and centre so it’s hard to keep track of what we’ve ordered but one thing is for sure- everything is amazingly good! I’m a fan of all things crunchy, so the fried salmon skin and the vegetable tempura nigiri were both winners for me. In Australia we’d more likely see fried items in rolls, but most options are available as nigiri here and presented beautifully too! And just like pizza, they also offer half and half options too, which is perfect when you want to try everything but don’t have the stomach space for it all! I went for the whelk and akanishi clam as I had not a clue what either of the two were, although google tells me they are both shellfish of some sort. We love how the Negitoro (minced tuna) nigiri almost looks like a brain sitting atop a rice ball, but unfortunately, it wasn’t as fresh and enjoyable as we’d hoped. The chawanmushi (steamed egg) however was absolutely delightful, so much so that we were tempted to order another one each. The egg is ridiculous smooth and silky, and whilst we were expecting it to be mostly egg, we were surprised to find that they don’t skimp on the filling at all!! But sushi trains need not all be about the fish either. If you’re feeling a little fished out and wanting some meat, there’s the cleverly designed hamburger nigiri- consisting of the cutest mini meat patty you’ll ever see, with a dab of melted cheese, sitting atop the usual ball of rice. The meat to rice ratio is much higher than that of your usual nigiri, and although I can’t say it was the best combination, it was worth ordering for the experience! Those looking for a meat option that’s not so out there might go for the prosciutto migiri, which looks deceptively like a lighter coloured tuna nigiri but tastes a world away. At 108 yen for two pieces don’t expect the best quality prosciutto- it was sadly, the only dish we didn’t manage to finish. And just because we could, we also ordered the cheese fries (don’t judge!) which were surprisingly good, and sliced pineapple, to end on a sweet note. We couldn’t leave Tokyo without a visit to Tsukiji, and whilst we didn’t wake early enough to see the auctions, we did manage have a bit of a stroll around the more touristy side of the markets which was exciting enough for us. We’re glad we had planned where to eat prior to arriving as there were so many options at the markets, most with incredibly long queues too. 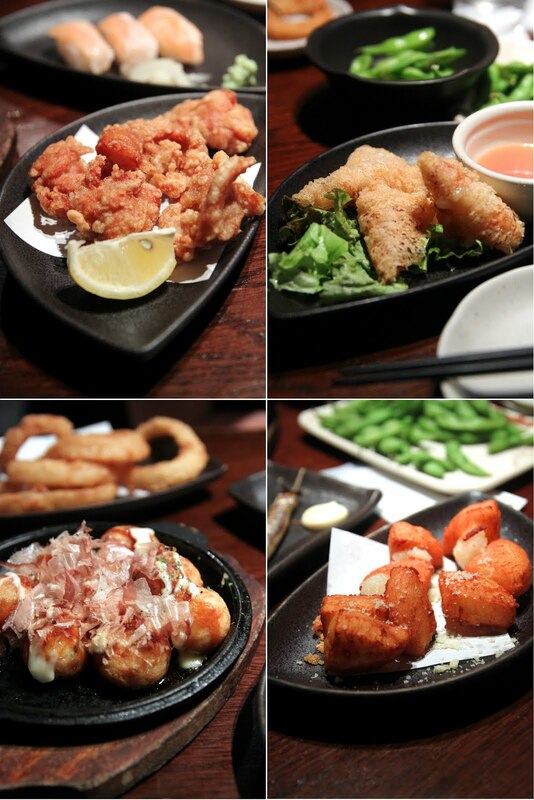 Instead, we walked a little further out of the markets to find ourselves at Sushi Katsura, situated in a tiny alley, and although it has quite a good presence online, its location meant that it was a lot quieter than we had anticipated. Infact, we were surprised to find that we were the first ones in the restaurant! Their lunch sets are incredible value, and a quick google search will find you endless numbers of rave reviews for their quality sushi. We opt for the 1.5 person set for only 1050yen, which gets us 11 pieces of nigiri sushi and a maki roll.. We’re seated at the bar so each piece of nigiri is prepared right in front of us and placed onto our bamboo leaf, three pieces at a time. With no one else in the restaurant, it makes for a very exclusive dining experience, without the fancy price tag. 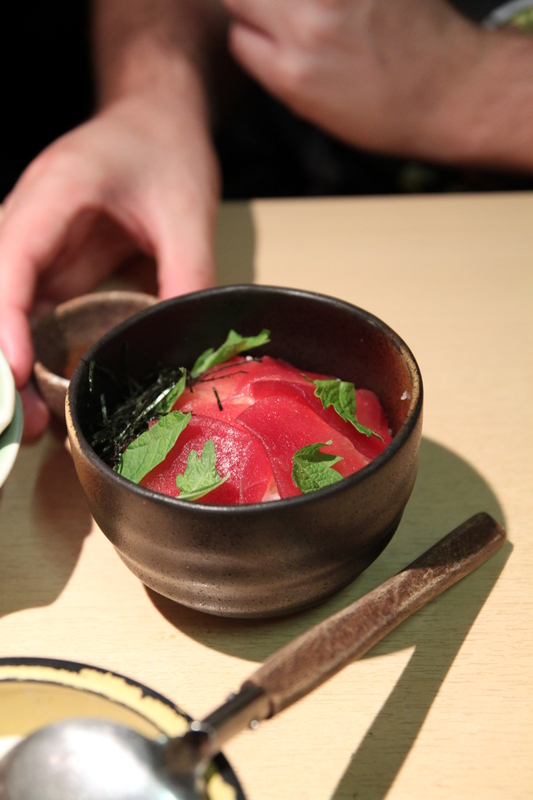 We’re super impressed and would definitely recommend for anyone visiting Tsukiji. 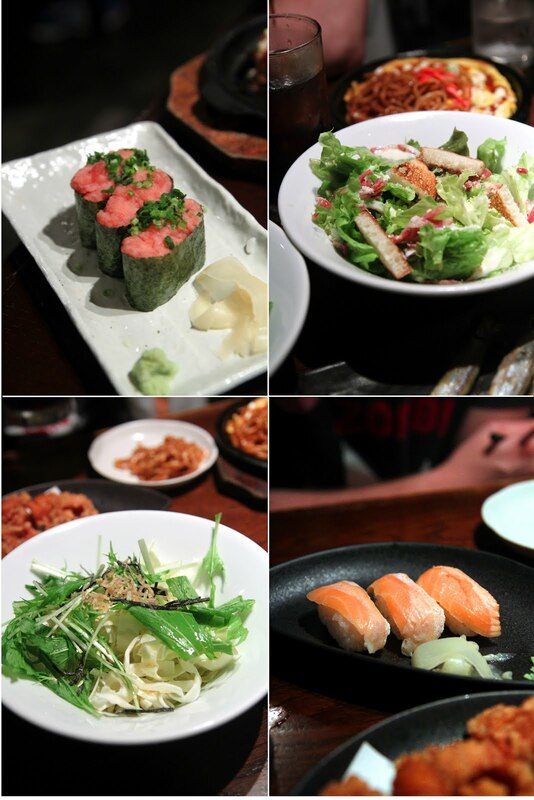 If I only had time for one meal in Tokyo, I would make sure it would be Midori sushi. We visited on my last trip to Tokyo, after reading positive reviews online, and although we were expecting good food, Midori sushi surpassed out expectations in every way! We were lucky enough to only have to wait around 20 minutes on my visit- our wait this time was around 1.5 hours, and it was quite late in the night too! Regardless, it is definitely worth every second of the wait! Whilst I usually tend to order a variety of foods from the menu (and try not to order the same thing more than once), I loved my last experience so much that I ordered exactly what I did the last time, starting with this sashimi salad. The sashimi salad is really to die for, and whilst I’ve had plenty of delicious sashimi salads in Sydney, nothing comes close to this one! We’re lucky enough to get a seat by the counter this time, so we watch the sashimi salad being prepared right in front of our eyes, with a very generous serving of cubed sashimi, plenty of avocado and tomato sitting atop a bed of fresh lettuce, and finished with a drizzle of mayo, salmon roe and shallots. There’s some kind of sauce in there which mixes with the mayo to marry everything together and whilst we can’t figure out exactly what it is, the combination of everything is nothing short of amazing, and the freshness of all the ingredients really does shine. I’d definitely recommend visiting some time before lunch and dinner for the shortest wait, or if you are coming for a late dinner, by at least 8:30 because they have to close off the queue early to shut on time. Given my love of Unagi, I made sure we stopped by a nice and fancy, well rated Unagi restaurant on my last visit to Japan. This time I made sure Unagi was on the itinerary somewhere but thought I’d try a cheaper alternative this time.And by cheaper, I mean all the way down to the other end of the spectrum to try 500 yen unagi at a Unagi don chain, Unatoto! Prices are unbelievably cheap, starting at 500 yen for a small unagi don and ranging up to 2000 yen for a full sized unagi fillet. Quite a contrast from the 5000 yen starting point at the restaurant we visited on our last trip. But at these bargain prices, how did it compare? I was actually very surprised, it definitely exceeded my expectations for the price point. The unagi is charred with a nice smokey flavour, and glazed with a good amount of the sweet sauce. At 500 yen, you don’t get a massive amount of eel, but certainly enough to satisfy an unagi craving. The menu doesn’t really deviate much from the eel on rice options, but there’s a couple of different toppings you can add if unagi don is a little plain for you. For 300 yen extra, you can get a nicely poached egg and sprinkle of shallots atop the eel. It’s a little different but works surprisingly well, with the taste of the shallots complementing the eel and runny egg acting like glue to keep the components together. Definitely a winning combination!